#COP21 : what if we started "decarbonising" our food? 1.3 billion tonnes – that’s the amount of food intended for human consumption which is wasted or lost every year, according to the United Nations Food and Agriculture Organisation (FAO). In fact, in 2013 the FAO announced that if food waste were a country, it would be the third largest producer of CO2, behind the USA and China. At a time when a call to arms has been sounded in the fight against waste, SIAL is looking at the latest initiatives aiming to ‘decarbonise’ our food. The Cumulus Green indicator was launched by a Swiss supermarket chain called Migros, and is designed to raise awareness among their customer base by allowing them to see how much of what they consume is ‘green’. This recorder of sustainable products combines 12 labels. The aim is to use mass data from consumers to give them greater transparency. In 2015, this service allowed the chain to highlight the average proportion of ‘green’ purchases made by their Swiss customers, amounting to 18.2% of everything they bought, as well as providing a breakdown by area. A 1% increase can be observed in comparison with the year 2014. This is a way of highlighting the environmentally friendly actions of every budding eco-warrior and increasing collective efforts. On average, 20 to 30 kilograms of food per person are thrown away every year in France. And according to the recent Parliamentary Commission report by Guillaume Garot, expiry dates “are usually the reason for a product being wasted, in distribution and catering as well as by consumers”. Some products therefore end up in the bin while they are still edible. This habit does not help consumers to fight against waste, but is there a solution? 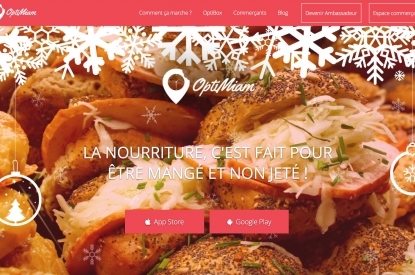 The Parisian start-up OptiMiam tracks the location of products which are about to go out of date, so that consumers can benefit from cut prices. By connecting retailers and large distributors with end consumers in this way, the start-up helps to avoid waste and unsold stock. As for its results, 90 retailers and almost 30,000 consumers have now signed up to the application. This success allowed them to win French Newspaper 20 Minutes’s competition for innovative start-ups aimed at the active urban population, as well as winning an award at the 2015 GES (Global Entrepreneurship Summit). 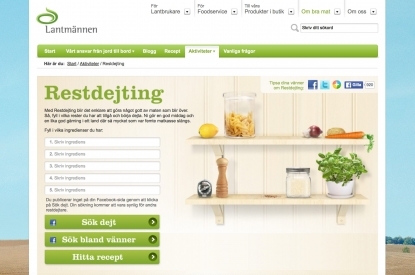 Lantmännen, a Swedish agricultural cooperative, is riding the Web 2.0 wave to fight against food waste. Its Restdejting platform allows us to pool the leftovers in our fridges in order to share meals with neighbours, lonely web users or singles. This is also a way to avoid the loneliness of meals in the big cities of the future, something which around 1 in every 2 town-dwellers fears according to a recent study lead by TNS-Sofres/Fondation Monoprix. What if the #foodporn trend on Instagram – a phenomenon which involves photographing your food from every angle and then sharing your photos on social networks – could help fight world hunger? This is what the Spanish humanitarian organisation Manos Unidas is suggesting, with its ‘FoodShare Filter’ application that allows you to share your meal. The principle is to use an Instagram filter to digitise the act of giving by adding the dedicated hashtag, #FoodShareFilter. With 30 billion photos shared, the digital sphere seems to be a real lever of solidarity that food leaders could activate in their quest to join web users in their actions to support the planet.